Sooner ot later a hard landing or crash is going to result in a broken fuselage. The following describes the repair job on my 2M Prospector fuselage. The prospector has a single seam rolled fuselage (ROLLFUZ method) with an overlapping join along the fuselage bottom. The method outlined here will work for conventionally joined fuselage halves, as long as the tape joining the halves is not too thick. If the fuselage has the cables still attached and they cannot be easily removed, prepare the fuselage by slitting one of the joints for about 2 inches on either side of the break. If the push rods can be removed there is no need to slit the fuselage joint. 1) Broken fuselage with opened slit on bottom. 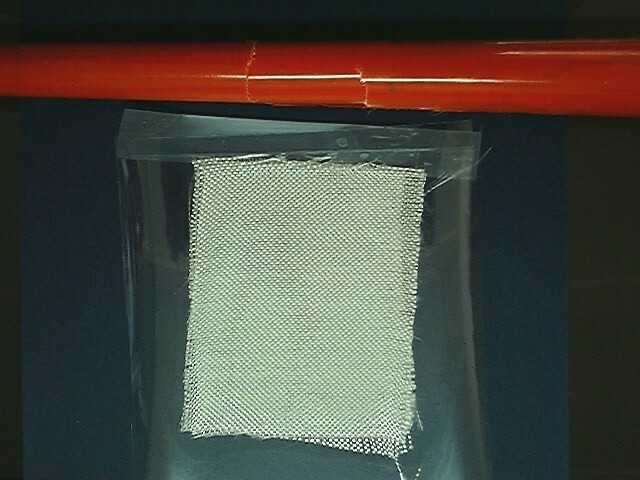 2) Prepare glass patch (in this case 2 layers 4 oz cloth)and sandwich between two layers of thin clear acetate taped on one side. (see Rollfuz fuselage construction page). Peel back upper acetate layer and wet with resin. replace acetate and expel all air bubbles in the sandwich. Tape the closed end of the sandwich to the boom lightly and roll the sandwich around the boom fairly tightly and secure with tape. Set aside to cure. When cured, remove the sandwich by sliding back along the fuselage and if necessary opening the sandwich a little to clear the fin. Remove the acetate from the glass tube. 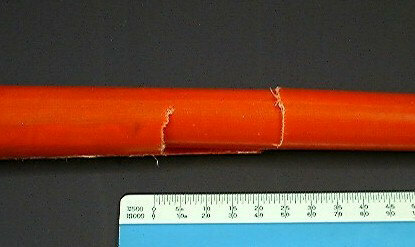 4) This shows the glass tube with acetate removed and before trimming. Trim to about one inch on each end longer than the break. 5) Partially inserted tube with resin. The next step in the operation is to insert the glass tube into the slit at the bottom of the fuselage and slide it in until it is completely inside. as the tube is being slid in, coat it liberally with resin and slide it back and forth to ensure resin is transferred to the inside of the fuselage. Ensure that the split fuselage joining is treated with resin. Also, any fibres around the fuselage breaks should be resin filled. 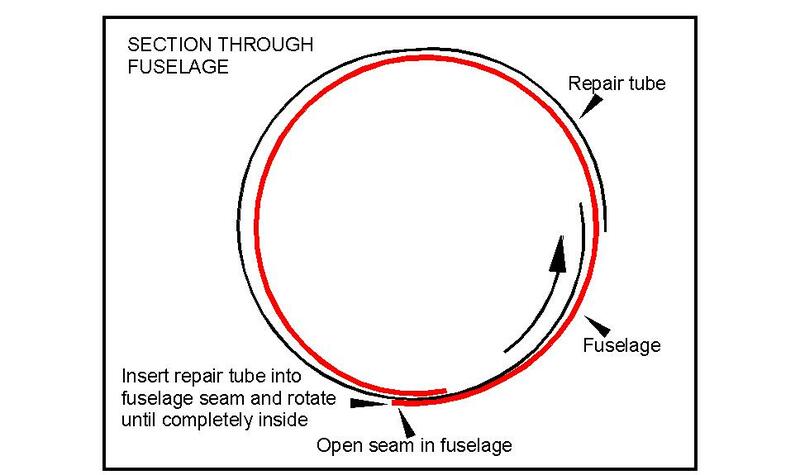 The tube should exert enough outward pressure to maintain contact with the fuselage walls. This method is used in cases where the fuselage has not been fully separated due to anchored cables at the front and back end. If the fuselage is in two pieces the assembly of the joining tube and fuselage halves should be easier. When everything is in place tape lightly over the break and align the fuselage halves using splints, making sure everything is square. To finish off, cover the break area with a layer of light (1.5 oz.) cloth.